Tom Warner and Sion Edwards met way back in 1997 at Agricultural college. I'm not sure anyone would have predicted that fifteen years later they'd end up joining together to embark on one of the country's most exciting gin ventures. Still, that's exactly what they've done: Warner Edwards Distillery's Harrington Dry Gin was only launched four months ago, but it's already being sold in Fortnum and Mason (ooh, fancy!) and is the talk of the industry - already having won a Silver at the San Francisco World Spirit Competition this year. So-called because the boys are based in the quaint village of Harrington in Northamptonshire, Harrington Dry is the only artisan gin that is distilled, bottled and packaged all by the producers, all on-site. These lads are seriously serious about what they do: from their adorably named bespoke still 'Curiosity' - made by Holstein who are the only company with a patented catalyser that gives a smoother finish to the gin - to their sharp blue packaging with not one millimetre of artwork unexplained. The 'W' and 'E' of the weathervane has a surprising number of meanings: both 'West' and 'East of course (and also Tom is from the East in Northants, Sion the 'West' in Wales), the names Warner and Edwards, and Water and Elderflower, both of which are meticulously selected from the centuries-old farm on which their distillery is based. They set up Curiosity themselves one idle Saturday with friends and family, so it's not surprising they've chosen 'United in Spirit' as their slogan - it's just as much about their own passions as it is the desired effect of their gin on its consumers. 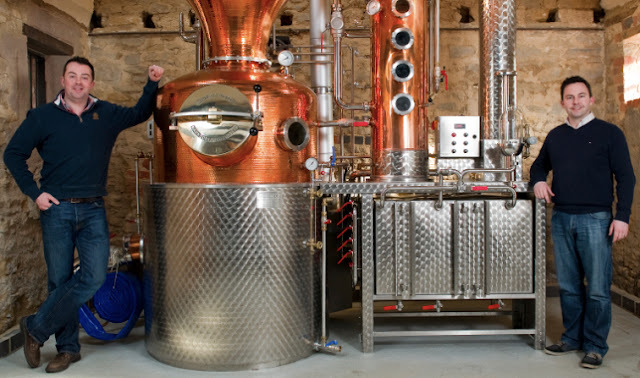 Their true craftsmanship is certainly what you'd call a USP, but it's far from the only thing that makes them exciting: they're also the only gin distillery in Northants (possibly the only ever - they can't find any historical sites either) AND the only gin being marketed as a 'sipping' gin. Have you ever tried to sip gin? It usually involves coughing and a feeling uncanny to that of your face innards being ironed. This isn't so surprising for big, cheap bland brands, but it's also true of so many of the more expensive, artisan gins on the market. And then there's Harrington Dry Gin: sublime sippability, bottled. It's beautifully clear and denser than your average gin, and as soon as you get a whiff you won't be able to stop whiffing: it provides wave upon wave of delicate florals, hints of pepper, zesty, herby grassiness, and the soft gentle sensation of ginger and elderflower. The same is true of the taste, with more elderflower in abundance, and such smooth, balanced texture that it's dangerously easy to drink. The warmth and ginger-zings make this a beautiful winter drink, whereas the clean, fresh elderflower makes it hard to resist in the warmer months too. At 44% abv, there's not many spirits this strong I'd drink on their own, but a glug of Harrington on the rocks is delicious. It's also the only gin I'd consider for my cocktails - everything from The White Lady (coincidentally, there's a ghost called The White Lady who walks the land of Warner Edward's distillery) to the Elderflower Gimlet, both of which we'll be telling you about over the next week or so. "Every day is a school day for us," Tom told us when we visited last week, but we think they could teach many a big brand gin a thing or two. You can pick up a bottle of Harrington Dry from their website for the RRP of £33, and it's also sold at Fortnum and Mason, and all good local wine merchants (Cambridge Wine and Oxford Wine included). Tom and Sion will also be appearing on Countryfile this Sunday 7th April.